Register now! Registration is live for U Lead We Lead 2016! 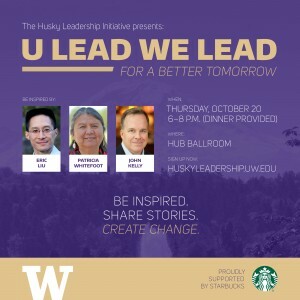 Join us for the Husky Leadership Initiative’s signature event to kick off the school year. It is a cross-campus collaboration of faculty, staff and students that uses the art of storytelling to motivate leaders of today and tomorrow. At U Lead We Lead, faculty, staff, and students build conversation in small groups that encourage active participation and sharing. No lectures about leadership here; this event is all about stories, experiences, and learning from one another.